I have been thinking a lot about making a pavlova inspired cupcake. Mostly because I love pavlova, its one of my most favorite non-chocolate desserts, but also because this cupcake is a composite of 5 recipes and I love the challenge of combining flavors and textures to get something cohesive yet multi-dimensional. I am very pleased with the result. I used a classic vanilla cake as the base, layered on some vanilla pastry cream with chunks of persimmon, topped with a meringue disk dipped in whipped cream, and finished with a persimmon chip. I’d say its a study more of texture than flavor – crumbliness of the vanilla cake, creaminess of the pastry cream, chewyness of the meringue disk and persimmon chip, and coolness of the whipped cream came to together nicely. Flavor was vanilla-sweetness with a subtle persimmon thing going on, not too sweet, nice afternoon treat. 2. Prepare sheet pan by cutting a sheet of parchment to fit, then tracing a circle the size of the top of your cupcake paper, and then flipping the paper. 3. In the bowl of a standing mixer, add egg whites, salt, and cream of tarter. Whip with the whip attachment until foamy, about 3 minutes. 4. Add the sugar, cornstarch, vinegar, and vanilla and whip on medium-high until stiff and glossy, about 10 minutes. 5. Transfer into a pastry big fitted with a large, plain tip. You may have to add it in two stages. 6. Pipe rounds using the pencil marks as a guide. 7. Put the sheet pans in the oven and then immediately adjust the oven to 250 degrees. 8. Bake until surface starts to crack and has slight color, about 50 minutes. Turn off the oven and open the door slightly. 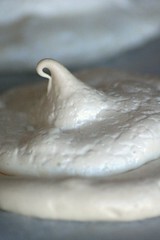 Allow the meringue to cool undisturbed for about a half an hour. 2. Heat sugar and water in a pan over medium-high heat, stir until the sugar dissolved. Lower heat and let syrup continue to simmer. 3. 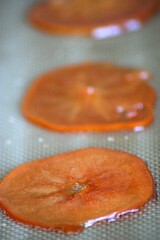 Using a mandolin or sharp nice, make thin slices of persimmon. Toss the slices in a little lemon juice. 4. Add the slices into the syrup and let them cook for about 2 minutes. 5. Remove with a slotted spoon and transfer to a sheet pan covered in parchment paper or a silpat. 6. Place sheet pans in the oven and let the slices bake for 2 hours. 7. Flip the slices and let them bake for another 30 minutes. 8. Remove from the oven and let cool. 2. Whisk egg yolks, cornstarch, and remaining 1/4 cup sugar in a medium sized bowl until combined. 3. Slowly add 1/2 cup of the hot milk mixture to the egg mixture, whisking continuously. 4. Add remaining milk mixture slowly while whisking. 5. Transfer back into the pan and heat over medium-high heat, whisking constantly until it thickens. It will thicken all of a sudden, give it a good whisk then take it off the heat. 6. Transfer to the bowl of an electric mixer, add the butter, and with a paddle attachment beat on medium speed for 5 minutes. 7. Transfer to a bowl, cover will plastic wrap touching the cream, and refrigerate until cool, hour or so. This can be made a day in advance. 8. Peel, core, and chop persimmons to small chunks. Fold into cooled pastry cream. 1. Cream butter in an electric mixer until smooth, about 1 minute. 2. While beating, drizzle in sugar. 3. Continue to beat until fluffy, about 2 minutes. 4. Add one egg at a time, beating well after each, about 20 seconds. 5. In a medium bowl whisk together flour, baking powder, and salt. 6. Combine milk and vanilla. 7. Add flour mixture and milk mixture to the electric mixer, alternating and starting and ending with flour, beat well after each addition. 8. 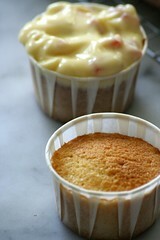 Scoop into lined cupcake tins, only half full to leave room for the pastry cream. 9. Bake until golden and a cake tester comes out clean, about ~22 minutes. 10. Let cool for 15 minutes in the pan, then transfer to wire rack to finish cooling. 1. Whip cream in the bowl of an electric mixer with the whip attachment at medium-high speed until soft peaks form. 3. Whip on high speed until firm peaks form. Transfer to a bowl, cover with plastic wrap, and refrigerate until needed. 1. Fill cupcakes with pastry cream. 2. 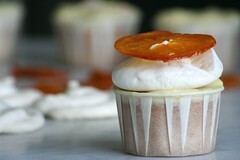 Dip meringue disks into the whipped cream, then flip and place on top of cupcakes. 3. Finish with a persimmon chip. Glad you’re back– more cupcakes, mmmm. Where do you find your cupcake wrappers, specifically the ones that look Dixie cups, like the ones in this post? Thanks. I am always looking for recipes with Persimmons, they are so neglected in the food World. I have a little question though, I would like to do cupcakes for christmas but we will have a quest who is absolutely allergic to eggs. Is there a way in the world of cupcakes to make these without eggs? (I know it is almost unspeakable but maybe it can be done?) I did a google search but so far didn’t come up with something edible, could you please help? Thanks a lot! wow! back with vegeance eh ? lovely persimmon chips. delish. Hi! I live in the Philippines and Persimmon is not widely available here. IS there any other fruit you can suggest I use for this recipe? I really want to give it a try. THanks! Hey, nosheteria – I am trying to hunt down where I got the cups… They are called portion cups. You can froogle it and see. 3.5 ounce are closest to regular cupcake size (1 ounce for mini’s). They are hard to find in small quantities and I can’t locate the place I got the 3.5 ounces! I will keep looking and let you know. baking soda, I haven’t worked on any such recipes personally, but I have seen this site before which has some handy substitution information specifically for people with allergies, http://www.foodallergykitchen.com. socampo77, I am so happy to hear that my recipes have worked out for you! I get a little stressed about that sometimes :) Anyway, I actually prefer this recipe with berries, basically any fruit with some tartness. I think it balances out the sweetness better. Also, the classic combination with pavlova is kiwi and strawberry. Good luck! I’m glad to see your cupcakes again! I missed seeing what you are baking up! Thanks! I wish I wasn’t so busy these days. I realized this weekend though, how much I had missed making cupcakes… I am going to try to find the time to make some this weekend. I wish I had discovered your site ages ago! I got a box of really yummy persimmons for Christmas and I was wondering what to do with them besides eating them as is … sigh. Great recipes!